Knight’s ATA4000 Overhead Mounted Vertical Mast Arm has fixed control handles that improve ergonomics by eliminating the need for an operator to bend or reach. It is typically used in applications that require significant up and down travel and precision placement. The arm can either rotate 360 degrees or can be fixed mounted for the operator. 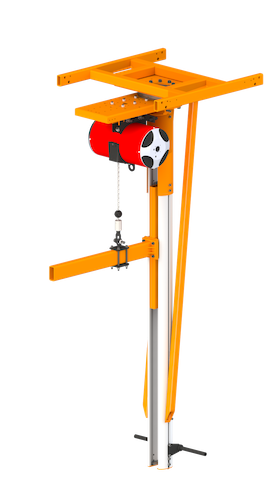 The ATA4000 Vertical Mast Arm can be used with any Knight Balancer or chain hoist. It can also come with an attached bearing clutch and friction (bumper) parking brake. This arm has a maximum capacity of 500 lbs. [226kg] and a maximum torque of 853 ft/lbs. [1,156Nm]. Maximum travel varies with each application. Contact a Knight representative for more information on our Overhead Mounted Vertical Mast Arm. Handles in a fixed ergonomic position on the mast. Rail Length Available: Up to 15 ft. [4.6m]. Max. Torque: Up to 853 ft./lbs. [1,156Nm]. (Lengths over 48 in. Contact a Knight Representative). Max. Capacity: Up to 500 lbs. [226kg] at 100 psi [6.8bar]. Can be used with a Knight Balancer or Chain Hoist.